Enterprise 11/18/72, 18:5:16 hours | Ich bin ein Sender. Ich strahle aus! | I am a sender. I transmit! 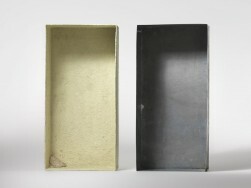 Among Beuys’s many hopes for the future evolution of humanity was the prospect of our species transcending life on earth and travelling to other planets.1 It is this fascination with the prospect of an off-world existence that is at play in the multiple Enterprise 11/18/72, 18:5:16 hours. 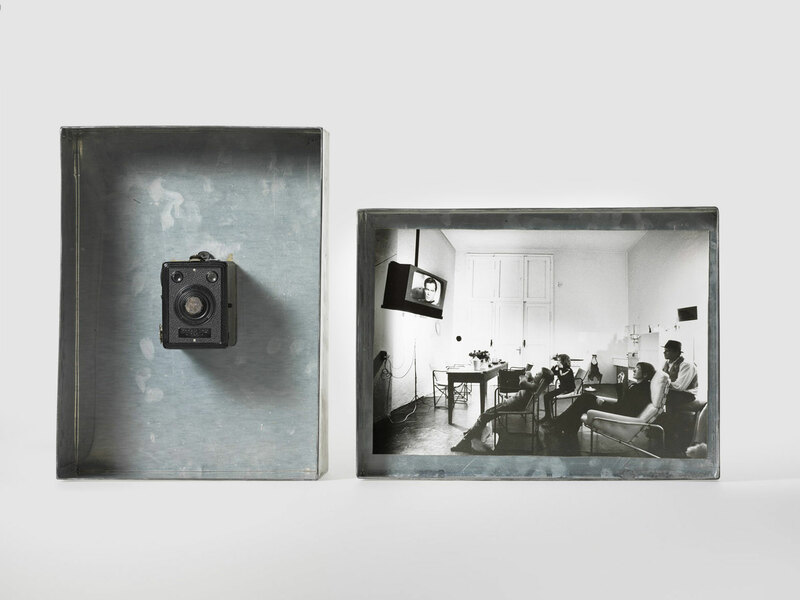 The work consists of a zinc box in two parts, one half of which contains a camera and the other a photograph by Michael Ruetz, depicting the artist and his family watching television in their Düsseldorf home. Both the image of the actor William Shatner, whose face is visible on the TV screen, and the title of the work itself, identify the program they are watching as Raumschiff Enterprise, the German title of the U.S. science fiction series Star Trek. 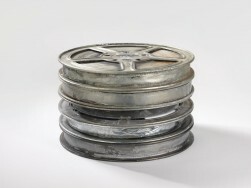 Beuys certainly recognised television’s potential to act as a facilitator for artistic ideas.2 Nonetheless, a more sceptical attitude towards television was predominant in his art. This became clear in his 1966 performance Felt TV, in which he covered the screen of a running television with a sheet of felt and hit himself repeatedly with boxing gloves. As he later recounted: ‘The point is that I filter out the information coming from such media. I myself am the information about the tragedy, about the event or about the aggression that this medium very often has, so this is all done by me. This means that the viewer himself is much more important than anything coming out of the box.’3 In Enterprise 18/11/72, 18:5:16 hours, Beuys echoed the Felt-TV performance, by replacing the lens of the camera in the work with a small disc of felt. As the photograph opposite the camera makes clear, here too the position of the viewer is important. Man [sic] in no way an earthly being. He is on way formed for the living conditions here below…. Perhaps he will live on other planets one day, under other conditions and in another kind of body.